This science cafe is an informal forum for discussing interesting and relevant scientific issues. We encourage public engagement with science by inviting members of the scientific community to present topics for a casual evening of conversation. 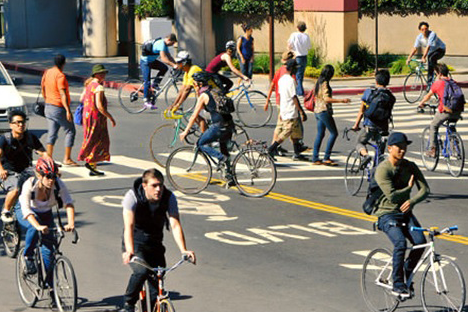 Berkeley is a leading city in promoting walking and biking for transportation. The City recently adopted a new Berkeley Bicycle Plan (2017), laying out a Low-Stress Vision Network to promote bicycling. Hear how a process of data collection, public engagement, and analysis led to this vision, as well as the ongoing development of low-stress bikeways such as those included in Complete Streets projects on Bancroft Way and Hearst Avenue. Our speaker will also discuss the Berkeley Pedestrian Master Plan (2010) path-breaking demand and safety analysis and forthcoming Vision Zero update of this plan, with the ultimate goal of reducing traffic fatalities to zero.